Are you drawn to adult’s or kid’s martial art training – but hesitant to try it as you’re unsure what to expect? Taekwondo has so much to offer and at Pacific International Taekwondo we put the focus very much on you. Training at Pacific International Taekwondo is fun and rewarding for adults, teens and kids. Many people think of it purely for the fitness and defense benefits but there’s much more to training than that; you will get fit, learn how to defend yourself, develop new stamina, flexibility, focus and a general sense of well-being. The Taekwondo training process influences your mind-set too, increasing your confidence and self-belief while you enjoy training and making new friends. Taekwondo – the Korean Art of self defence has become one of the most popular forms of martial arts worldwide. Taekwondo literally means ‘Art of Hand and Foot’ i.e. Tae Kwon Do. In Korean, Tae refers to the foot being used to jump or kick, Kwon means to use the hand and Do refers to the ‘art of the way’. So much more than just a self-defence program, as you become proficient in Taekwondo, you will be become a fitter, stronger and more confident version of yourself. As a practitioner of the art, you will gradually progress from white belt beginner level through the ranks becoming fitter, faster and feeling stronger with each belt you achieve. As you become more skilled, you will be able to use punches, strikes, kicks, dodges and blocks for self defense and for enjoyment during class training. But the art is about so much more than just punching and kicking for self-defence. It enables you to get fit, have fun, build up the condition of your body and train your mind to be far more controlled and disciplined. When involved in lessons, you will release stress and tension whilst being shown how to perform powerful, synchronized hand and foot movements. Your body and mind will be shown how to work together to get the results you want in an atmosphere that is fun, friendly and relaxed. You don’t need to worry if you have not taken part in any type of martial art training before or are not as fit as you would like to be. Starting off very slowly and taking it one step at a time, we will show you how to master the skills of Taekwondo. Located in Brisbane and on the Sunshine Coast, we want to hear from you. Get in touch with us today to find out more about our Taekwondo classes and how they can enable you to become fitter whilst acquiring fantastic martial arts skills. Mastering your own body begins here. Our adults’ martial arts and Taekwondo training program is the ideal way to challenge yourself in both body and mind. These classes can improve your mental capacity and ease your stress and tension. This Taekwondo and martial arts class is intended to train teens from beginner, white belt level. The program teaches basic techniques that focus on building strength, flexibility, fitness, and balance. I initially enrolled my daughter to learn some basic self-defence and also to gain some fitness. Since joining Taekwondo she is learning a valuable new skill set that is giving her more confidence, fitness, discipline, respect and the ability to protect herself should a situation arise. Pacific International Taekwondo is a family environment and we were made feel welcome from day one. I am really impressed with all the instructors who guide the students to better themselves. They give so much of their time to ensure that each student is ready on grading day. I would thoroughly recommend Taekwondo to anyone who would like to build their confidence or fitness level or learn a new skill. 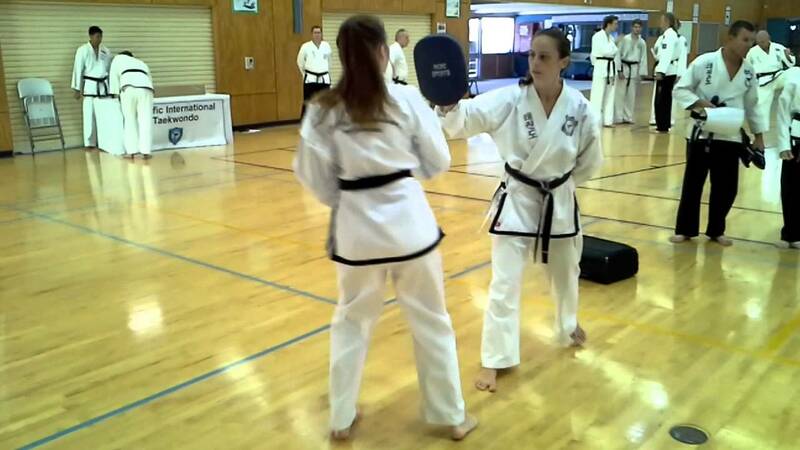 My name is Alanna and since commencing training at Pacific International Tae Kwon Do as a white belt I have increased not only my fitness and strength but also my self confidence. I have lost an incredible amount of weight and I have not felt this good about myself in years. I am an anxiety sufferer and a busy mum so a training session is a much needed “me time” and is a fantastic help to my mental wellbeing. I always complete a training session feeling invigorated and happy. I am currently a very proud green belt. Next stop blue belt and I am determined to go all the way to black belt and beyond. My ultimate goal is to become an instructor to share my knowledge and skills with people wanting to learn and feel the way I do about Tae Kwon do. It is definitely a positive influence in my life. I really enjoy my training sessions with Pacific International Taekwondo, it helps relieve study stress and get fit in an enjoyable way. SI Shane is my instructor and has taught me a lot during my time at Albany Creek but all the instructors are very helpful whenever I ask for advice. I would recommend Pacific Int Taekwondo to anyone who wants to have fun and even make new friends while becoming stronger and more flexible. It’s really difficult to put into words exactly what Pac Int Tkd is and does. It has taught me more about myself and what I’m capable of than anything I’ve ever done. I’ve met some amazing people and watched them do some of the most incredible things. It’s fun and exciting and constantly challenging, but most of all it’s a journey that once I began I never wanted to stop. I have been training with Pacific International Taekwondo since I was 10 years old. It has taught me many things in that time, not only about defending myself but it has helped build my confidence, made me more disciplined and it taught me how to respect both myself and others. There are a lot of health benefits to Taekwondo as well. Over the years I have gotten fitter and stronger. Overall Pacific international Taekwondo was everything I was looking for when I wanted to learn martial art and so much more! – I would recommend it to anyone no matter who they were. Taekwondo with Pacific International is more than just martial art training. It’s a way of life and this is reflected in the tenets or the way we do things. All tenets are easily and importantly transferable outside the training hall. Courtesy, integrity, perseverance, self-control and indomitable spirit are all great concepts for adults and younger students to learn. Training as a family unit also means we learn lots about each other and what’s required for improvement and support. As a parent with young boys, learning Taekwondo improves confidence, strength and fitness, while enabling them to hold their own. Not to mention a great way to meet new people. Pacific Int Taekwondo for me is a great activity. It encompasses fitness training, strength training- both inner and outer and entrusts great discipline. I can also do the sport with my children in the same class. My daughters aged 6 & 10 learn about commitment and rewards for effort (through grading). I feel more relaxed in the knowledge that they will be better able to have the confidence to protect themselves in today’s world if they need to. The environment in which I train and grade with my daughters is good and safe with very committed and enthusiastic people. My Instructors and Master Instructor Dicks are very inspirational and positive people for me and family to be around. I thoroughly enjoy doing this sport. Get the kick start you need. Contact us for a 7-day free pass today!